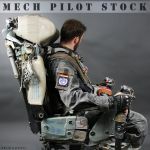 Third Photo of our Mech Pilot Series. 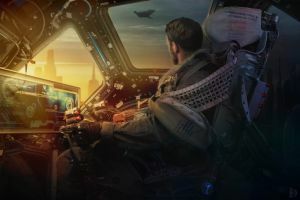 Feel free to add a cockpit and some landscape. There will be more coming soon. Thank you for supporting our art. We can provide any reference pose you may need on commission to keep this running. well... you can easily add those devices to the picture. Of course I would have used them if I had these equipment... but I can only work with what I have. I should do more in-cockpit reference sketches for Red Straggler when I'm done with the batch of Science Patrol-themed fanart. Thank you. It took years to realize this session. I'm glad it came together so well. Thanks for sharing! 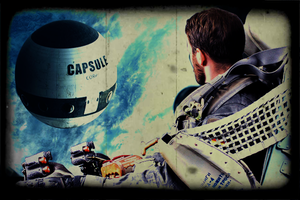 Do you know what the ejection seat comes out of? It comes originally from a MIG 21. Quite a vintage. Works really well! Really Nice and usefull stock I probably use thank you ! Thank you. It took me years to organize this series. Hope it works out. don't know if i'll personally use but i see a LOT of potential here. especially with the perspective, this is a very high quality original stock photo! It took several years to organize all this and finally make this photo session. Great concept! I will have much use for this series. You can only move your head and your arms in this seat... the rest of your body is perfectly fixed... that is not pretty comfy. The seat looks high-tech. 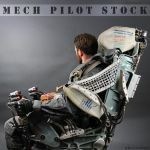 It looks like it could either work for a ship, or the suits in Avatar and the Matrix. Or whatever you want. There are no limits. I`d even put it into my car! I haven't had much practice with digital art, I'm waiting until I get something like Photoshop. 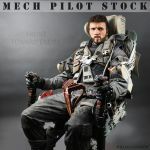 Mecha pilots don't require helmest?? Such a cool setup! Genius idea, nice job.